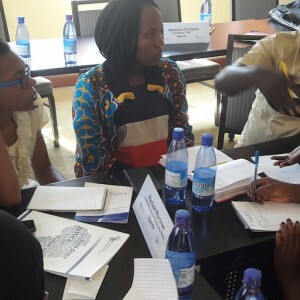 The Institute for Security Studies’ African Centre for Peace and Security Training (ACPST) provided training to youth-led institutions that are engaged in peacebuilding in East Africa. The training aimed to develop the capacity of practitioners and institutions to engage in peacebuilding planning, implementation and monitoring. The 12-day training course, which took place in Kampala, brought together 23 participants from Botswana, Kenya, Rwanda, Somalia, South Sudan, Sudan, Tanzania and Uganda. The course provided an in-depth understanding of peacebuilding trends, paradigms and responses. It also improved participants’ capacity to carry out conflict-sensitive data collection and analysis, design theories of change, develop plans for implementation and monitoring as well as evaluation strategies and tools. Specific attention was paid to cross-cutting issues such as local ownership, diversity, substantive equality, networking and gender mainstreaming. Participants shared the challenges they face in their work. These challenges were then analysed according to the new strategies and approaches discussed during the training. This provided them with different ways to develop their peacebuilding intervention. ‘I believe I can now easily identify a problem and reliably design an intervention for a conflict,’ says Jane Ndibarekera from Uganda. The course was delivered by a diverse team of facilitators, namely: Golda Keng, (ACPST-ISS), Haddie Naballe (UNDP Uganda), Ndubuisi Christian (ISS), Ngassa Franklin (Kayiwa International University), Rossette Sayson (EU Delegation Uganda), Samuel Mweru (ISSAU) and Yaya Bio Bawa (ACPST-ISS). Using the skills they had acquired during the training, participants developed project proposals and presented these in a mock donor roundtable on the final day of the workshop. ‘The training taught me how to design an intervention project from the beginning to the end. I am fortunate to have had this opportunity,’ said one participant.